The collection is in its original order as bound. William Martin was born in Philadelphia on September 2, 1765 to English emigrants John and Mary Martin. He graduated from the University of Pennsylvania Medical School in 1786, and established a practice in Georgetown, VA. Three years later he returned to Chester, PA where he continued his medical career. In April 1789 Martin was chosen on behalf of the citizens of Delaware County, PA to give a welcoming address to George Washington on his way to New York for his presidential inaugural. At some point Martin began to study law, and was admitted to the practice in 1794. In 1797 he was appointed Justice of the Peace for Chester, Ridley, Middletown and Lower Providence in Delaware County. Martin died on September 28, 1798 after contracting Yellow Fever from the crew of a British ship under his care. The William Martin Papers consist of miscellaneous manuscripts that were bound by his grandson, John Hill Martin, around 1865. The documents include legal cases (mostly forms examples of writs), medical observations, correspondence, speeches, and literary extracts in Martin’s handwriting. They were bound in no particular order. William Martin’s University of Pennsylvania Diploma is in the Diploma Collection (UPP 231) and listed in the Archives General Pre-1820 Guide (No. 1771). Address regarding Pennsylvania Constitution, 1794 September 25, 40 pp. Pennsylvania Court documents, 1757-1759, 33 pp. Address regarding Care of the Poor, n.d., 4 pp. Notes on Pneumonia Cases, 1792 March, 2 pp. Medical Case Notes, 1789 March, 2 pp. The Passions, n.d. 4 pp. Punishment of Crimes, 1789 January, 9 pp. Literary Extracts, 1774-1795, 13 pp. 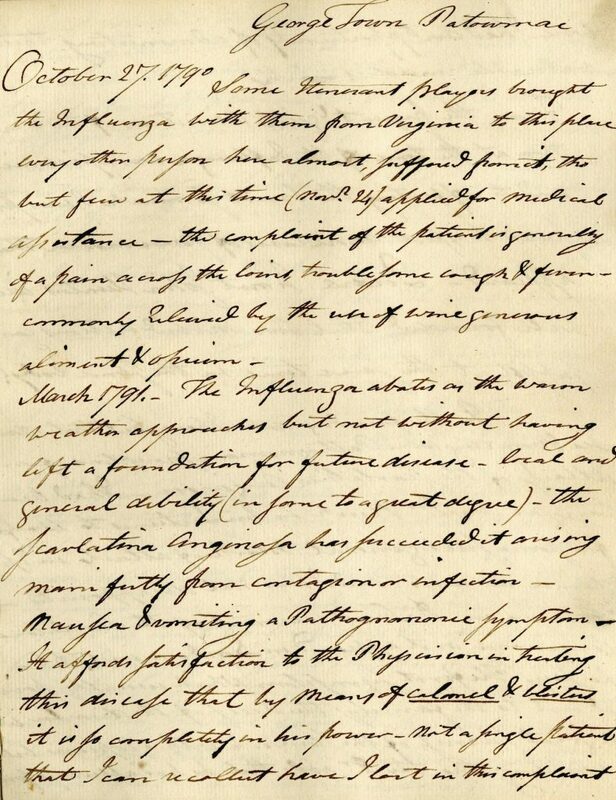 Case notes on Influenza in George Town, Potomac, 1790-1791, 4 pp. Extract on Rush Account of Yellow Fever, 1794, 1 pp. Hellorris, Richard ALS to William Martin, 1790 December 5, 3 pp. Rules and Regulations Chester Schools, 1796 January 6, 4 pp. Philadelphia Court documents, 1785-1791, 17 pp. American Longevity, 1790 January, 9 pp. Literary Extracts, 1773-1785, 9 pp. Observations on Infectious Disease, 1793 August 28, 4 pp. Notes on Yellow Fever, 1795 April 10, 6 pp. Literary Extracts, n.d., 52 pp. Martin, William to J. I. Preston, 1793 January 7, ALS, 4 pp. Martin, William to J. I. Preston, 1793 January 5, ALS, 3 pp. Journal de Physique extract, 1798 January 1 pp. Martin, William to J. I. Preston, 1793 August 17, ALS, 3 pp. Martin, William to J. I. Preston, 1794 July 27, ALS, 3 pp. Extract of Court Document, 1792, 4 pp.